Okay folks, this is clearly not a recipe! I just thought it could be useful to some of you readers to share my favourites for a perfect antipasti platter - basically a way-out for those days when you don't want to cook too much! Sometimes, you spend a lot of time preparing a main meal and a dessert for guests (on this particular day, I was having oven-baked lemon halibut with sauteed garlic rapini and chocolate and lemon tartlets) and you don't want to spend too much time on an appetizer. On those days, or the hot summer days where you're only having a light meal with a cool glass of wine, an antipasti platter is always a great option. It's easy, pretty to serve and incredibly flavourful. All guests can make their own little plate from your selection and pick and choose what they like. Here are some of my suggestions for a perfect antipasti platter. Start with some cured ham - you can choose an array of different kinds (I would suggest bresaola, prosciutto, rosette de lyon and coppa), a selection of good quality olives (I love kalamata, greek olives as well as garlic and almond-stuffed green olives). Arrange the cured meat and olives on one platter. The only work here is to toast some fresh baguette for an extra touch. Cut the baguette into slices, drizzle a little olive oil and set in a warm oven. Once the bread is just crusty, remove from the oven and rub the inside of the bread with a peeled clove of garlic. This is a small and easy step but it really makes a big difference as far as flavour goes! On another platter, choose about 5 or 6 items amongst oil-preserved sun-dried tomatoes, anchovies, caper berries, sweet roasted garlic cloves, mini buffalo mozzarella balls and artichoke hearts. If you're serving this as a complete meal, I would suggest adding a simple lettuce salad with an array of chopped herbs (chives, parsley, coriander) dressed with a basic olive oil and balsamic vinaigrette. This recipe is just a guideline to the platter I served here, but let your imagination run free! Arrange nicely on 2 or 3 platters, serving the bread freshly toasted. Enjoy! 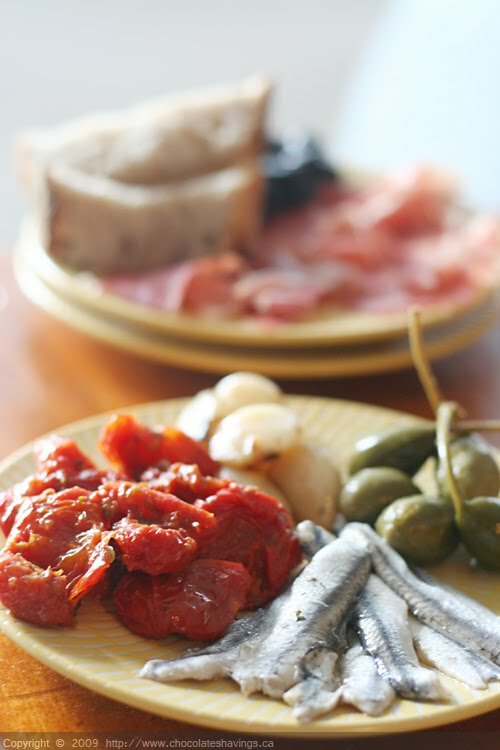 I absolutely adore anchovies but never thought to add them to antipasti! That is a brilliant idea. I love this! Your photo is absolutely gorgeous too. It may not be a recipe, but it's definitely a perfect idea for this weather! I've never put anchovies on my antipasti platter... usually lots of artichokes, roasted red peppers, meats and cheeses, and olives. I also serve hummus and/or baba ghanoush with pita triangles. Great recipe! To me this IS a recipe....a recipe for a great picnic or drinks with friends or just a quick snack while watching TV...superb! This looks sooo good!! And the pics are great! this is my idea of the perfect meal...an antipasti platter and some crusty bread. Antipasti plater is a lifesaver option. When you are already preparing the main course and dessert. And sometimes it's good just as a tapas night with some wine. I love your site you have amazing pictures. I love this, brings me right back to home. Something we had so often and always enjoyed. The best part about the platter was that my Dad used to make his own prosciutto and salami, so fresh and delicious and made with so much love. What I wouldn't do for a slice of my Dad's prosciutto! I love everything you included in your antipasti platter. It all looks beautiful. Grace: Homemade prosciutto would definitely bring this over the top! Have you ventured into trying to make your own? I would love to try! Jean: Thank you, I'm glad you're enjoying it! It's funny you ask because up till now I haven't tried to make my own but planning to set aside a day soon to spend with my brother in law. He makes his own and I am dying to learn. I know it won't taste exactly like my Dad's but it will still be amazing. I wish I would have done that with my Dad. There are so many things that he made year after year (cheeses, salami, roasted peppers etc..) that I took for granted because he always made them for me. I find myself trying to learn and every dish my mother has ever made for fear of losing all those delicious flavours. I wish they would have written recipes but neither ever did. I now find myself writing everything I do when I cook so my children will be able to replicate the flavours they've grown up with.